Summary: California and Quebec’s eleventh joint auction has cleared for the first time since November 2015. Today’s results have shown that the auction was oversubscribed with a bid-to-cover ratio of 1.23 for the current auction. The auction settled at USD 13.80, USD 0.23 above this year’s floor price. 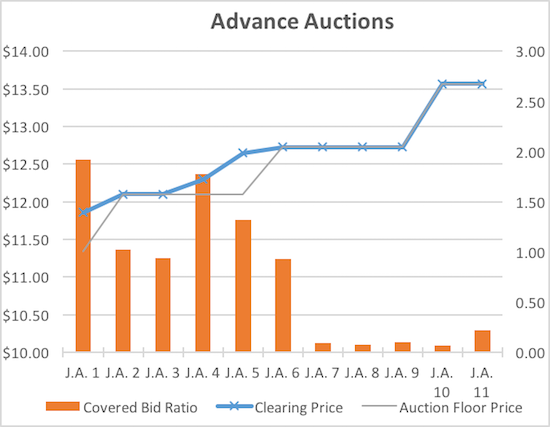 The advance auction also performed well, selling 22% of 2020 vintage allowances on offer at the auction reserve price of $13.57. *All emission totals and percentages used in this report are use the latest available emissions data: 2015 for Californian entities, and 2014 for Quebec entities. The total 75,311,960 allowances available for sale cleared the current auction, signaling an 80% increase in demand since California and Quebec’s first joint auction of the year. 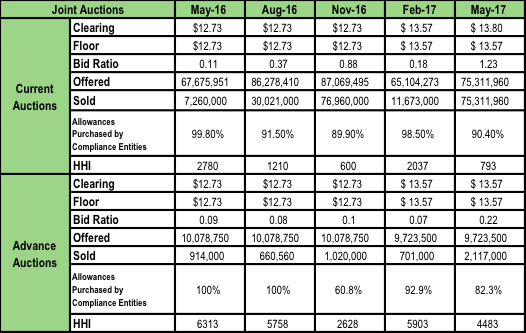 The positive result announced today is a function of February’s extremely low turnout which, for the first time in the market’s history, triggered a cumulative shortage for 2017 compliance. Using our forecasted demand for 2016, CaliforniaCarbon.info estimates that at the end of last year, the market surplus stood at 43.9 million and that 384,500,260 tons would be needed to meet obligations in 2017, thus the total estimated demand stands at 340,600,260 tons for the current year. The total budget for 2017 (APCR adjusted) is 414,220,800 tons of which only 42,226,000 tons were brought through the February auction – current and advance. A positive auction result today was therefore likely, considering that the remaining future auctions of the V2017 needed to perform well to meet anticipated demand. In addition, today’s announcement of a fully subscribed auction reflects an improved state of confidence within the market. A discouraging turnout of 0.18 in the previous auction was largely attributed to the negative sentiments brought to the market by the pending CCC vs ARB court case which questioned the program’s legal autonomy. California’s appeals court case ruled in favor of ARB in early April, however, banishing the surrounding uncertainty and bouncing prices on the secondary market by over USD 0.50. Despite the price resurgence last month, participating in California’s carbon market has been anything over the last few weeks. Wieckowski’s ‘carbon tax with a twist’ bill (AKA SB 775) brought with it new uncertainty in the market when proposed at the beginning of this month. Frail in comparison to the uncertainty imposed by the CCC vs ARB case, prices dropped by a little over USD 0.40 on the front contract over the week following the announcement before climbing again. 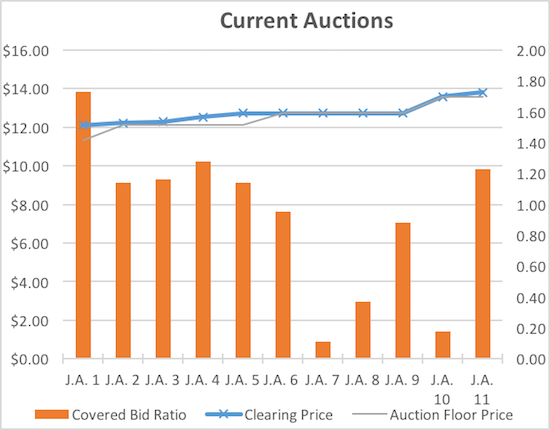 A slight dip in prices the day prior to the auction suggested that this uncertainty might still knock auction expectations, however, mid week trading last week hinted at a more positive auction result. With the results of the auction well anticipated by market participants, little activity was felt on the secondary market in the moments following ARB’s announcement. At time of writing the current front contract (May 17) is trading at USD 14.00, equal to before the notice and USD 0.20 the better than the auction clearing value of USD 13.80 for the current auction. The advance auction also showed positive results with a 0.22 subscription ratio for 2020 vintages. The average turnout for the four previous future auctions was around 0.08. The rise in interest in future allowances highlights the increase in market confidence lately with traders willing to hedge on future options. Soon-to-be partners, Ontario, hold their second auction on June 6, 2017. As ever, CC.info will be releasing a deeper statistical breakdown of trends and observations from the latest joint auction in our After-Auction Review. Stay tuned!